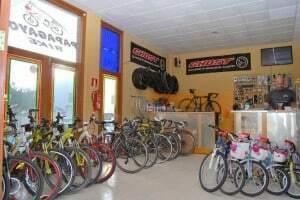 At Papagayo Bike we provide you the best service for bike rental on the island of Lanzarote 365 days a year. Anything you need, we will be there for you. Our experience, bikes and human team make our force, joining quality, assessment, amusement, security and a wide range of bicycles ensure that we can completely fulfil your requirements and wishes. We are dedicated to cycling and we have been operating in Lanzarote since 1998. We have two centres on the island, one in Playa Blanca and another in Costa Teguise. We invite you to visit this unique island and explore the exceptional sunshine cycle it offers. Our team knows the island like the back of our hand. Let us surprise you and we will show you the very best that Lanzarote has to offer. Come and meet our experienced staff who will detail the numerous routes for mountain-biking and road-biking. Follow the the famous Iron Man route on one of our high end race bikes or get an off-road experience in the volcanic areas. Lanzarote is well signposted to improve your experience. Costa Teguise located in the Northeast of the island, is the perfect place to start any road excursion or mountain excursion. You will find major climbs in the Tabayesco where you can do good training and enjoy marvelous sights when approaching the “Mirador del rio”. For the family you will find a beautiful seafront connecting Arrecife, Playa Honda, Puerto de Carmen and Puerto Calero. Papagayo Bike will attend all your cycling requirements whether at our base in Playa Blanca or in Costa Teguise. From the base of Playa Blanca, situated in the southern tip of the island, the landscape is just extraordinary. You have the nearest access to The National park of Timanfaya, El Golfo, Los Hervideros, Los Ajaches, La Geria and much more. You will be able to make unforgettable trips on mountain bike or road bike …..or simply join us on one of our excursions.